RapReviews.com Feature for April 10, 2007 - Brother Ali's "The Undisputed Truth"
Ali the new name by which greatness is known"
If you missed his intensely personal 2004 debut, "Shadows on the Sun," there are a few things you need to know about Brother Ali: He's an albino, a devout Muslim, a proud father, and one of the best rappers to ever grace a microphone. And from the moment the hard guitar riff of "Whatcha' Got" (above) blasts through your speakers, it's clear that the Brother is on a mission with "The Undisputed Truth." The title is as fitting as it is grandiose; Brother Ali is as honest as a rapper can be, he's as likely to give a self-conscious commentary on his own actions as he is to declare that "the truth is here." Also important to know is that like "Shadows on the Sun," Ant of Atmosphere produces every song on this album. Far from treating this like a side project, Ant pours his all into "The Undisputed Truth," the music here is tinged with musical samples that range from funk and soul to rock and country. His production here is more consistent than on Ali's debut, the rhythms are stronger, more melodic, and this makes "The Undisputed Truth" a much more musically engaging album than "Shadows." Although the elements and sound of his production is consistent, Ant displays an incredible range here, the slow, sad "Walkin' Away" sound just as natural as the quirky rhythm "Lookin At Me Sideways"
Although Ant obviously gives his all here, it seems as though Brother Ali is adapting to his style rather than the other way around. The production is usually very good, but one of Ali's best gifts is his incredibly strong voice. He handles Ant's rhythmic approach very well, but he usually sounds best over hard, banging beats like "Whatcha' Got." Unfortunately, that's the only song here which is anywhere near that strong, and one or two more bangers would have served this album well. But I raised my little man to teach him how to live"
For all intents and purposes, Ali and Ant give a flawless performance. There's not a wasted moment, a weak beat or verse here. There are no guests, and no skits, just Ali blessing every great beat on the CD. It runs at almost sixty minutes, but there's no point where the album stalls or gets repetitive. The variety between deliveries, tempos, and themes keeps everything fresh. Ant's beats are immediately engaging, and Ali interacts with them effortlessly, even handling many of hooks, and doing extremely well with all of them. Thematically, the range here is amazing. Brother Ali has the same conviction with the braggadocio style of "Take Me Home," the catchiest song of the album, as he does tackling the personal issues involved in joining the military in "Letter from the Government." His verses rarely settle on the chosen topic, either, offering a multi-layered, personal take on all subjects. Even his most arrogant raps are possessed of a remarkable intensity. And he's just as passionate in his more personal songs, thanking his son for the opportunity to be a father on "Faheem." 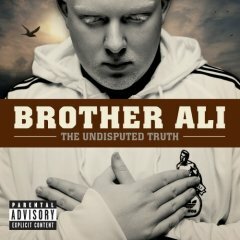 With "The Undisputed Truth," Brother Ali improves as a rapper, while sacrificing none of the unique, personal touch that made "Shadows on the Sun" so impressive. He's religious without being dogmatic, enlightened without preaching. "The Undisputed Truth" manages to cover all bases while maintaining a consistent sound, and is a must have for any music fan in 2007.